Astounding for the mesmerizing natural beauty, Pahalgam valley is located at the confluence of Lidder River and the streams originating from serene Sheshnag Lake. The valley is located 96 km from Anantnag district. At an altitude of 2,130 m above sea level, this lush green valley is most sought by travelers seeking relaxation and leisure. The valley offers breathtaking panoramic views of the beautiful Himalayan Ranges. Pahalgam is the base camp for the renowned pilgrimage to Amarnath and also a famous shopping place for woolen products. It forms a part of the region in Asia where Saffron is growing. Pahalgam valley is perfectly suitable for adventurous activities like golf, horse riding, trekking and many water sports. The unexplored undulating hilly terrains and the plain valley regions included in Kashmir tour packages are equally eye catching. Baisaran, a calm and attractively beautiful meadow, is a nearby attraction. This meadow is located at an altitude of 2,438 m above the sea level. Snow clad mountains and lusting pine forests add the beauty of this meadow. One can have breathtaking views of Pahalgam valley and the Lidder river valley from this hilltop. Snow covered Tulian Lake is another impressive spot for natural views located nearby Pahalgam. Lidder valley with mind blowing and eye catching natural views, the snow flowing river Lidder and the ancient temple Mamal Shiva temple are all very attractive nearby attractions in Pahalgam. Pahalgam offers all necessary facilities for the tourists to have a rejuvenating and impressive vacation travel. 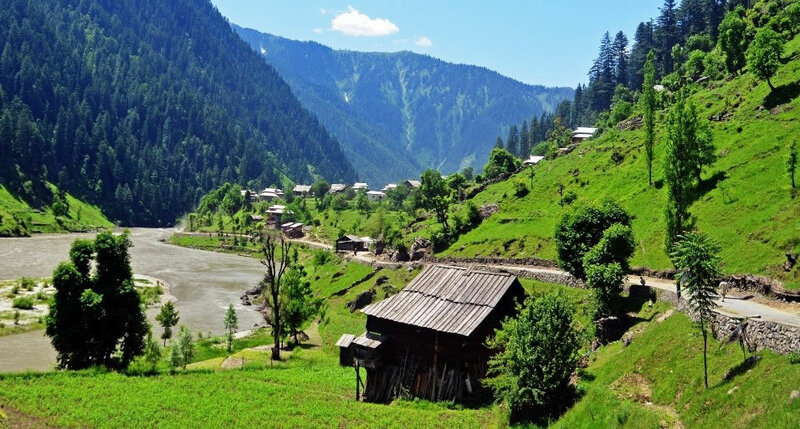 Situated at a distance of around 5 km from Pahalgam, Baisaran offers panoramic views over the town as well as the Lidder valley. An exciting place at a height of 150 m, where streams flow through the meadows and pine trees is truly amazing. Aru Valley is a small yet self-sufficient scenic village located 12 km from Pahalgam. The drive up to the village is alluring too. The location of the village among the grasslands, make this place a tourist delight. It is reachable by walking along a mountain path. Located on the way to Chandanwari, the valley was named Betaab after the Bollywood movie by the same name! Earlier known as Hajan Valley, after the release of the movie, it was renamed as major part of the movie was shot here. Set amid picture perfect environs complete with snowcapped mountains, gurgling streams, colorful willow trees & the warm sun; making it an ideal for an artist’s canvas! The valley is a walk-able distance from Pahalgam. Situated above the Lidder River, Kolahoi glacier is a hanging glacier known for its breath taking views. Trekking is the sole mean of reaching the glacier, however, horses and ponies can be hired to cover part of a distance. The terrains to reach the glacier are extremely challenging and are not advised to be undertaken by inexperienced trekkers. Lidder River that runs through Pahalgam is also an attraction of the region. It is one of the important tributaries of the Indus River. The river can be reached only via trekking and here tourists can enjoy angling. Please note that equipment needs to be carried from Srinagar as it is not available here. Rafting too can be enjoyed here. Moreover, Kolahoi Glacier is a nearby attraction to visit. Tulian Lake, also known as Tarsir Lake is a beautiful water body near Aru (15km from Pahalgam). The lake is located on a height of 4,000 m above sea level and can be reached by undertaking 2 day long trek from Aru. The lake remains frozen for most part of the year. Ponies too can be hired to reach the lake. Horse riding is an adventure option to do while visiting Pahalgam. Besides, it is a means of transport for tourists visiting Pahalgam. Ponies can be hired directly or through the Tourist Office and on all the important locations of Pahalgam tariffs are displayed. White waterr rafting is another aquatic adventurous sport that can be indulged in Pahalgam. A 2 km stretch on the Aru branch of Lidder River is the popular rafting spot in Pahalgam, its gentle gradients are well suited for newbie. In Pahalgam, white river rafting generally starts in the month of June. So enjoy the fun of rafting in Pahalgam. Spell bounding natural setting, adventurous trekking trails, snowcapped undulated hilly terrain and the pleasant climate during springs and summers make the trekking expedition in Pahalgam a wonderful experience. Formidable mountain ranges, amazing valleys and plateaus make the region of Pahalgam suitable for all types of trekking, mild to very challenging. Pahalgam-Suru Valley, Boktal Pass, Lonvilad Gali are all perfect trekking trails connecting Pahalgam. Pahalgam serves as the base camp for many trekkers. Mountaineering routes and trekking trails are all challenging for the adventurous travelers. Day treks and hikes are usual tourist activity in this region. Fishing is one activity that can be indulged while visiting Pahalgam. Tourists can enjoy fishing at Lidder and Shesh Nag streams, which are popular for beautiful trout fishes. Fishing season stretches from April to September, while the equipment can be hired from Srinagar and live as well as spinning is not allowed. Fishing permits are issued at Pahalgam for a maximum of 3 days at a time, charging on a per day per rod basis (permitted to catch 6 fishes on daily limit). For permits tourists have to contact the Directorate of Fisheries, Tourist Reception Centre, Srinagar. Pahalgam is renowned as a tourist destination in which one can enjoy the sports Golf. It has a nine hole golf course, which is now being extended to 18 hole, is open for tourist. It is located at the top of the Pahalgam valley (1.2 km walking distance) perched at a height of about 2400 meters above the sea level. The golf course is in the vast expanse of large plain region. This plateau region is ideal for working out best golf play. Pahalgam has a cool and pleasant climate in summers and very cold climate in winters. The best season for Pahalgam tourism is from March to November. (October to February) are chilly and snow bound. The minimum mercury level goes below sub zero levels and the region mostly covers receives fresh snowfall. The views of the landscape are excellent with snow covered hilly terrains. (July to September) are very scanty. The region becomes highly humid during this period.